Last fall I visited my friend Kate’s house in Southern Maine for a gathering of strong women to observe the change of the seasons. In addition to our festive activities, we ventured outside for a photoshoot among the New England Autumn colors. Kate lives in a historic and well known house that just happens to have an adjacent family cemetery for the original homeowners and their family. The cemetery is technically owned by the town and has sadly been neglected for sometime. It is quite overgrown and among the hand-carved headstones dating back to the mid-1800’s is a plethora of plants that are thriving. In particular, Burdock has completely proliferated the entire burial site. When I first saw the grounds completely covered with the prickly little Burdock heads, I was quite taken aback. You may know Burdock as those prickly little balls that stick to your clothing and hair who notably inspired the invention of Velcro. The little hooks that grab on and won’t let go are known as burs and they function to attach to wildlife and debris in hops of spreading their seeds for the coming seasons. 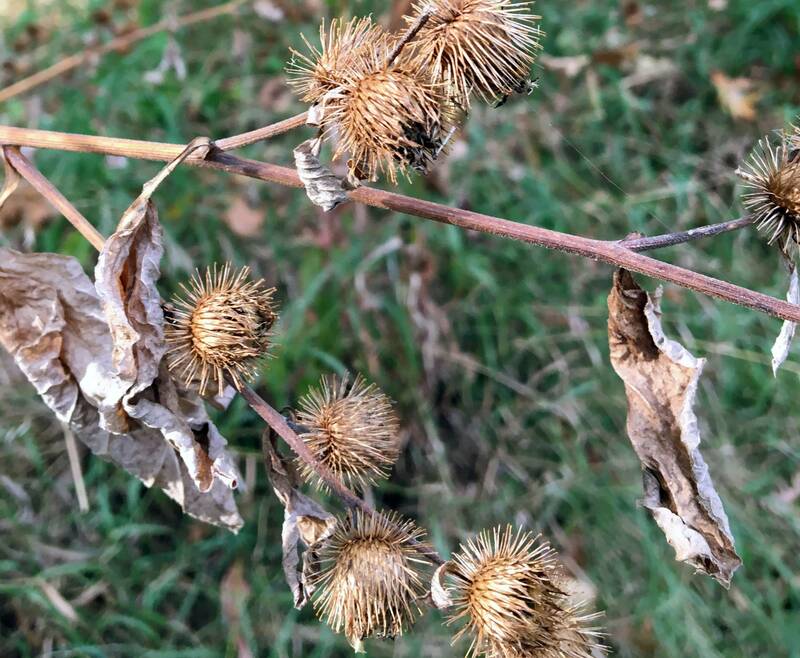 What we know about Burdock (also known as thorny burr) from a traditional medicinal view is that it is well known as a blood cleaner. Burdock also has been traditionally used for infections, cold/flu, bacterial overgrowth, inflammation, skin conditions including acne and hives, and liver complaints. Energetically, this cemetery covered in Burdock was absolutely stunning. The cemetery contains human remains dating back a century and half, when the deceased were not preserved in the manner we practice today. More often than not, a family would grieve with the deceased before burial. Knowing Burdock as a blood cleaner, I couldn’t help but think that all the Burdock was in the space to help ‘clean-up’ and stabilize the earth and other plants and trees in the vicinity of the burial grounds. The general ‘prickliness’ of Burdock and it’s ability to uncomfortably attach to passersby lead me to feel the inherent sense of protection Burdock holds. It was almost as if the Burdock was protecting the sacred site so that the remains of the family could rest in peace without disruption or discourse. I could visualize the roots of Burdock reaching down deep to surround the family and help maintain their integrity and comfort them. I could feel the drawing out of impurities being pumped back to the surface, traveling through each plant stalk, leaf, flower and out into the air in a grand release. I could see the impact of such a transformative plant ally working to maintain homeostasis among grief and sadness. I took a quiet moment to myself to acknowledge everything I was seeing, and feeling. I closed my eyes for a moment and reached down to touch the the hard working plant life. I exhaled a deep breath of gratitude knowing we are constantly surrounded by brilliant, omnipresent life energy. With a nod and ‘thank you’ to the family for allowing for my visit, I departed, profoundly changed by the experience. Blaine, Valerie. “How Burs Disperse Seeds in Fall.” Daily Herald, 27 Oct. 2017, http://www.dailyherald.com/submitted/20171027/how-burs-disperse-seeds-in-fall. “Burdock Root: Benefits, Side Effects, and More.” Healthline, Healthline Media, http://www.healthline.com/health/burdock-root#modal-close. Villines, Zawn. “Burdock Root: Benefits, Side Effects, and Uses.” Medical News Today, MediLexicon International, 17 Nov. 2017, http://www.medicalnewstoday.com/articles/320035.php. Previous Post Spring 2018 Items Have Arrived! Next Post Summer 2018 Items Have Arrived!